What follows is the beginning of the first chapter of Converging Destinies. It is my hope and expectation that many of you will want to be early adaptors–the first in line to tune in to the insights and paradigm I am advocating. As mentioned, this is just the beginning of the first chapter of the book. If it engages you, then go here and order it from the publisher at 20% off of list price. The best deal available. But first . . . read. 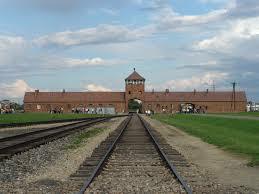 Surrounded by rolling farmland, looking like some harmless recreational camp-ground, Auschwitz waits. We arrive only to be swallowed up by the silence. Shuffling along, instinctively quiet, mirroring in life the ringing silence of death, we listen to bored tour guides regurgitating rehearsed explanations decrying “what Nazi Germans did on Polish soil.” But such learned scripts fail to drown out the sound of the silence sobbing about absence, millions of voices gone in a moment, and myriads of descendants of the holy seed of Israel forever unborn. Even on this sunny day, the darkness overcomes us, while the silence screams, there, at the edge of that foul maw that swallowed the holy nation, the royal priesthood, God’s treasured possession. A phoenix arising from crematoria ash, the modern State of Israel gave Jews a new voice in the council of nations, while repudiating two millennia of Christian assumptions. Facing unprecedented horror on the one hand, and ecstatic fulfillment on the other, both communities cry out, “Surely the Lord is in this place; and I did not know it” (Gen 28:16). Suspecting that God is breaking through the confines of comfortable provincialisms, like the congenitally deaf with cochlear implants now learning to hear for the first time, each community struggles to discern and interpret the voice of God as he speaks through the “foreign lips and strange tongue” of the other (Isa 28:11; cf. 1 Cor 14:21). But how do we discern the way out of an abyss where even God was given up for dead? And what is the right response to dry bones resurrected, realizing a prophetic hope sustained in prayer, marinated in blood, awash with the tears of two thousand years? Is it even possible to discover what God is up to in the world, and the roles he has assigned to Israel and the church at a time when graves split asunder? Increasingly, Jews and Christians are realizing that we must find answers to these questions, and must do it together. It is as if the Holy One has given to each community half of a treasure map indecipherable apart from the piece held by the other. Unless Jews and Christians can come together and form a respectful, trusting, and communicative partnership, the map will continue to remain obscure and its treasure buried, unavailable to all. Before she can partner with Israel and rightly interpret the treasure map of the purposes of God, the church must first hear as if for the first time God’s word concerning Israel’s enduring election, for she can neither accompany nor learn from her Jewish partner apart from this radically transformative hearing. In its early youth, the church became blind and deaf to these things. It is time to be healed, and the first signs of healing are already among us. At its birth, the church was already touched by Yeshua. And propelled by the convulsive impetus of the Holocaust and the founding of the modern State of Israel, churches and theologians are reaching conclusions, issuing statements, and adopting policies denouncing anti-Semitism and anti-Judaism, affirming the continuing election of the Jewish people. Yet, some view these developments with suspicion, dismissing such theologians as trendy post-Holocaust theological revisionists, as if theology must never be revised, even if it undergirded genocidal horrors. Even in those circles where such revisions are officially embraced, a paradigm shift is one thing, a shift in practice, quite another. It is hard for the church to see things differently, after two thousand years of skewed perceptions. It is harder for her to detect and uproot habits and reflexes shaped by millennia of supersessionist triumphalism. The church needs a second touch if it would see herself, Israel, and the Messiah as they really are, instead of in the distorted manner to which she has become accustomed. Indeed, both church and synagogue must learn to doubt their misperceptions as just so many walking trees, seeking a second touch from God bringing them into a new partnership. God has decreed that neither community can enter into the consummation of all things apart from forming this respectful, attentive, and communicative alliance. The first sign of their healing will be when church and synagogue see one another differently than before. This chapter highlights what Israel remembers and the church forgets, that the people of Israel are eternally beloved. The church needs to learn this lesson, review it constantly, and explore its implications deeply. Israel is destined to be her senior partner in the consummation of the mission of God. The idea of Israel being the church’s senior partner will be quite jarring and even offensive for many Christians, but far less jarring and offensive than when Jews endure the cacophony of church’s claim to be the new Israel—words that seek to unmake the “let there be light” of Israel’s creation. Leon Klenicki teaches how Auschwitz calls for intercommunal teshuvah (repentance) by both Jews and Christians, that “Teshuvah means to recall that history has changed human existence after the diabolic reality of Auschwitz. We are summoned after total evil to be together in, and toward, God” (Leon Klenicki, “On Christianity: Towards a Process of Historical and Spiritual Healing—Understanding the Other as a Person of God,” in Jews and Christians: rivals or Partners for the Kingdom of God? In Search of an Alternative for the Theology of Substitution, Didier Pollefeyt, ed., (Louvain: Peeters Press, 1997), 82. Reformed theologian David Holwerda comments, “The Holocaust and the establishment of the State of Israel have had a radical impact on the shape of the questions in the ongoing debate about Jesus and Israel. Jewish voices, silenced for centuries, demand to be heard. The Christian church should not be unaware of these voices and should reflect on how it speaks about the relationship of Jesus and Israel and what it claims concerning that relationship” David E. Holwerda Jesus and Israel: One Covenant or Two? (Grand Rapids: Eerdmans, 1995), x-xi. But surely the church must go beyond simply “not being unaware” of these “Jewish voices.” If the Holocaust did not chasten the church, nothing will, and a chastened church must be prepared to hear the voice of God from the lips of Israel, or else remain theologically autistic. Richard Peace opens our eyes to the blindness of the apostles and the long healing process God puts them through in Conversion in the New Testament: Paul and the Twelve (Grand Rapids: Eerdmans, 1999). Here, Peace defends his thesis that the Gospel of Mark is a study in the slow and cyclical conversion of the apostles, which process he contrasts with the crisis conversion of Paul of Tarsus. Peace challenges us to recognize that not all conversions are sudden turns of one hundred eighty degrees, For many, perhaps most of us, the turning is gradual, in stages, and involves regressions and recommitments along the way. agree except for ths part that theology must be revised – its not theology but doctrine must be revised! You are intelligent, Barbara, and since I graduated from Erasmus Hall High School in Flatbush, Brooklyn, you have a special place in my estimation! However, sadly, it is NOT simply spiritualization of the text that gets us in trouble. It is also wooden literalism, which is why some of the great Christian leaders of the past, like George Whitefield condoned slavery. They had clear Bible verses for it: not spiritualized. Literal. I wish things were as simple as you state, but ‘taint so. It does not go far enough. In this brief glimpse of your introduction, I found the reference to the “church” ambiguous. Perhaps that was deliberate, and perhaps you clarify it later in the book. I’m inferring that here you were referring to the post-Nicene definition of a distinctive Christian religious body, rather than to the assemblies of Yeshua-followers, gentile or Jewish, existing in the period ranging from the mid-first-century CE through the subsequent three or four centuries. Part of the theological redefinition — or more specifically, ecclesiological redefinition — required in our era is, of course, a rediscovery of the bicameral nature of the ecclesia, and the relationship between gentile assemblies and Jewish synagogae — any of which might be called an ecclesia, and both of which together should form a combined bicameral ecclesia of peoples called to the service of the Living G-d of Israel and the principles of His Torah. I’m not certain whether that also requires some overtly theological redefinition, for Christians to perceive the nature of G-d in a manner that impels them to re-affirm Jews and Judaism as the people of G-d and the way of living that He covenanted with them to pursue. Nonetheless, I’m sure you’re correct about invoking this model of regaining sight or clarity of vision in progressive stages. Thank you for your intelligent interaction. It is what I have come to expect from you.